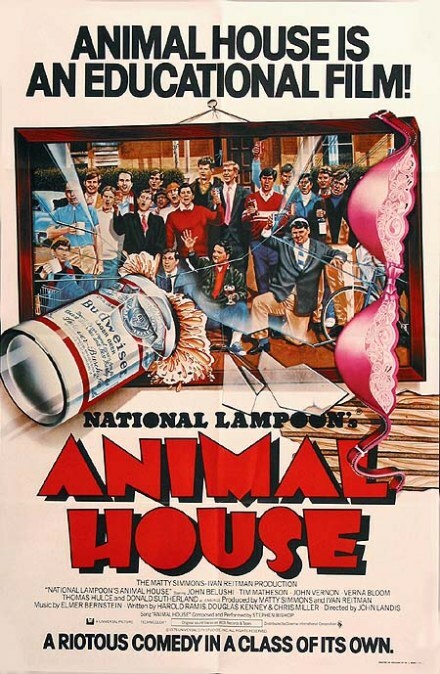 Animal House came out 40 (!) years ago this weekend. I was 16 years old and saw it at the old Annapolis Circle Theater with my buddy Greg and a couple dates. It’s still one of my favorite top 3 movies (along with One Flew Over the Cuckoo’s Nest and Pulp Fiction) and continues to inspire me in so many ways, a few of which could even be called positive. I’m sixteen. The world seems full of serious weirdness. Walter Cronkite’s talking about crazy violence in places with names like Afghanistan and Iran. In America, serial killers are running amok. Ted Bundy, Son of Sam, and the Hillside Strangler are in the news. Before the year is out, two Popes are gonna die. I’m on a double date with two girls from school and my buddy, Greg. On the Eastern Shore, getting your driver’s license has always been a big deal. Greg hasn’t had his for more than a month. We travel across the Bay Bridge (a challenge for any new driver and probably against his parents’ instructions) and around the circles in downtown Annapolis (even more of a nerve-tester) several times before finding a parking spot. The four of us walk to the old art deco theater, buy tickets, and go inside. Found it after your recommendation and loved it! I was a National Lampoon teenager (having graduated (somewhat) from Mad Magazine). Have you seen the Lampoon book/documentary Drunk, Stoned, Brilliant, Dead? Highly recommend!